Love in the Elephant Tent is a memoir and the debut novel of former circus showgirl Kathleen Cremonesi. In 1988, a friend that Kathleen met in Amsterdam managed to cajole her into joining a circus based in Perpignan, France. It was there that she met a man named Stefano, an Italian elephant keeper who cared deeply for the well being of the elephants. Having come into circus life with no real circus act to perform whatsoever, she rode elephants, ostriches, and even swam with sharks. Her relationship with Stefano faced some serious threats. The circus had a hold on both of them, caging them in some ways just like the animals. 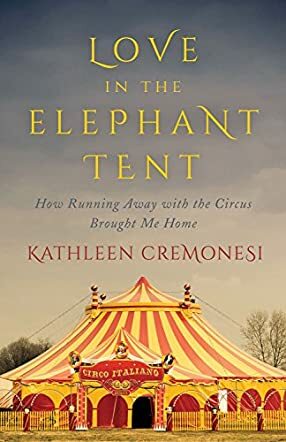 Kathleen takes us through the good and the bad times of her circus career, her love life, and the valuable life lessons she learned inside an elephant tent. Cremonesi transported me to an elephant tent in Spain in 1988 with well-structured sentences and beautiful words in the very beginning of the book. I could actually see everything she described in my mind’s eye; her vivid descriptions are there to give readers a wonderful reading experience throughout the rest of the book. The love story between the author and the elephant keeper is one that many fans of romance novels will enjoy and appreciate. I have never been to a circus before, but after reading this book I can truly say that I was at two instead of just one. The author provides some beautiful photos after her tale concludes and I was happy to see what some of the animals, especially Baros the giraffe and Stefano’s beloved elephants, looked like. I absolutely recommend this book to circus fans, romance novel junkies, and just about everyone who loves animals.